There are some new site features I’d like to point out. 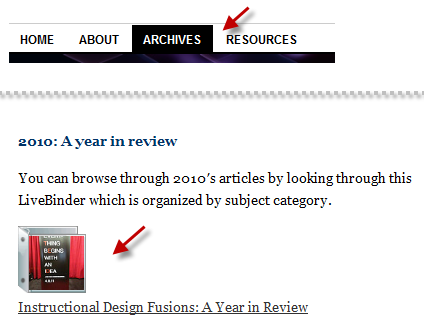 At the bottom right corner of this blog, you’ll find the “Daily News,” a Diigo webslides of paper.li resources I’m collecting. It’s a mixed bunch of elearning, mlearning, training, games, and health paper.li’s but you’ll be able to find the one’s you’re interested in by viewing the table of contents if you don’t feel like browsing. The learning-related paper.li’s are the first ones you’ll see. I’ve set it so the timer’s off so that you can advance the webslides at your own pace as you read through different paper.li’s. Remember that paper.li’s are created by individuals; they’re generally not endorsed by particular groups. The content’s not static, so this morning’s paper.li set may be different from this afternoon’s. 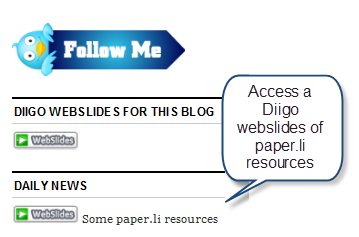 If you’d like to browse this blog, but don’t like the randomness of searches, you can play the Diigo Webslides for this blog which will display the last 50 posts. I’ve created some resources that I’ve blogged about in the past year, but in case you don’t want to hunt through the blog to find them, I’ve posted some of the major ones on this Resources page. Right now, you’ll find links to some Symbaloo resources, Trailmeme resources, and Diigo groups I moderate. This page will be continually updated as I create more. I hope everyone has a happy new year in a world more inclined to share than argue!